Midtown Bloggerinos! Raph here, to talk about the universe shattering announcement Marvel made! It’s a different world after Avengers vs. X-Men… it’s going to be a new era; time for Marvel Now! Uncanny Avengers: Captain America realizes his mistakes with the mutant community, and now forms a team of mutants and Avengers! Not only is this going to be a powerhouse team, it’s going to be written by Rick Remender and drawn by John Cassaday, a mega powered team in their own right! All New X-Men: Probably the most controversial and intriguing of the bunch, All New X-Men is centered around the original X-Men (Beast, Cyclops, Iceman, Angel and Jean Grey) coming to the present day Marvel U! The creative team of Brian Michael Bendis and Stuart Immonen sure have their work cut out for them; this is a book that will have continuity sticklers going up the walls! Avengers: Avengers is not a new book, but it does have a new writer at the helm: Jonathan Hickman! Hickman is a huge favorite amongst the Comic Store Heroes of Midtown (including yours truly), and I’m eagerly anticipating what he has in store for the Earth’s Mightiest Heroes! Hickman is known for his large, grandiose stories and masterful science-fiction integration. 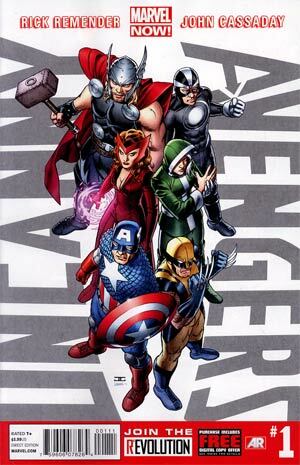 Hickman says the Avengers will have 18 members, and the book will release on a bi-weekly schedule.